NEW! The Techmar Round 30 is a must have for any garden. 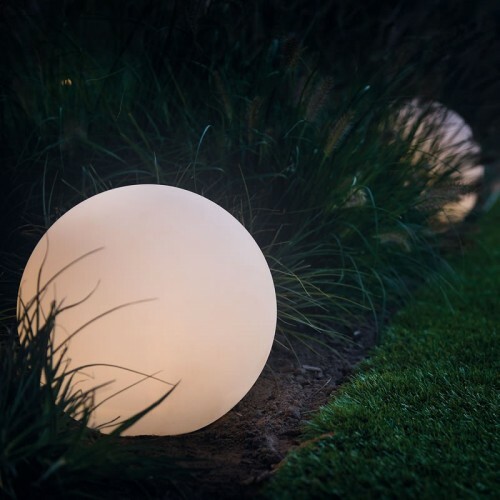 As well as being a great looking light, its ability to change colour and sequence gives endless mood light possibilities, and a great talking point at garden parties. The light is dimmable, has 16 colour settings and 4 preset functions (smooth, flash, fade and strobe) as well as a static setting. On white setting, it gives up to 52 lumen of brightness. Includes remote control, ground spike and feet for hard surfaces/decking. Comes with a 1.5m SPT-1 cable, to connect to your existing tansformer.